Do customers have trouble finding their way around your building? You’ve probably already thought to put up wall signs and possibly even some applied wall graphics—but what about floor graphics? Graphics applied to the floor offer a unique way to help people find their way around your building with style. 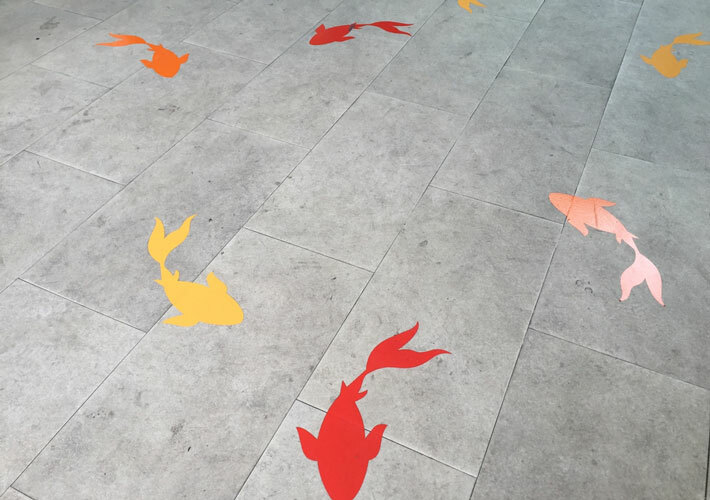 Here’s more on how you can help customers navigate your building with floor graphics. How do Floor Graphics Work? Floor graphics are like a high-end sticker of sorts. Materials and application adhesives are of a higher quality, and the installation itself requires more attention to detail, but the idea is the same. Applied graphics for flooring are designed, printed, and installed directly onto the existing surface. Then, once the floor advertising is no longer needed it can be peeled off with no damage to the underlying flooring. Your options for flooring graphics are limitless. As a nationwide supplier and installer of applied commercial graphics, here at AP Graphics we have a lot of insight on how you could use floor signage to your advantage. Give one of our product specialists a call today and let them help you figure out what could work best for your space. Won’t Floor Signage Get Messed Up? Floor graphics will get dirty, but they are durable enough to resist regular foot traffic. So, if you keep your floors properly cleaned, then the dirt won’t be a problem and your graphics can last for many years. Beyond dirt and grim, vinyl floor advertising signage can be scratched if something sharp is dragged across them. Keep this in mind with where you install these applied graphics. Can Floor Graphics be Cleaned? Yes, your floor signage can be cleaned. Whether you contract with a commercial floor cleaning service, or have your own on-staff cleaners, be sure to let them know when you are having your floor graphics installed. You will want to be sure the floor is clean before application and the graphic is left untouched for at least 12 hours to ensure proper adhesion. These times can vary based on the specific materials used in your installation so be sure to ask your installer about specific cleaning needs. For more information on applied graphics, the installation process for floor graphics, or for some ideas on how to implement your ideas, get in touch with AP Graphics today! We’re your premium supplier of applied commercial graphics for businesses of all shapes and sizes.